I will do your project myself, so I know it's right. Call today for a FREE quote and discussion. 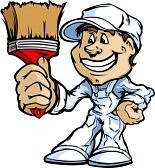 Colin's Painting is a internal house painting specialist. Using DULUX paint and only the best tools of trade, the finished result maintains our reputation for excellence. Low overheads means a better price.